The two halves of this skin relief model show the three layers of hairy and hairless skin in order to make the of the skin layers differences clear. 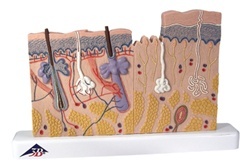 This skin model features detail with hair follicles, sebaceous glands, sweat glands, receptor, nerves and vessels. Skin section delivered on base. The Skin section is 40 times full size.